Wholesale Trader of a wide range of products which include shoe polish machine, shoe shine machine and shoe cover dispenser. For use in hospital, factory, laboratory, home, clean room, sample room and other places where clean dust free environment is maintained. 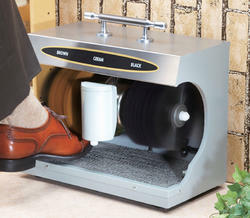 Looking for Shoe Polish Machine ?